MOVING (TraininG towards a society of data-saVvy inforMation prOfessionals to enable open leadership INnovation) is a Research and Innovation Action (2016 - 2019) that has received funding from the European Union’s Horizon 2020 research and innovation programme. 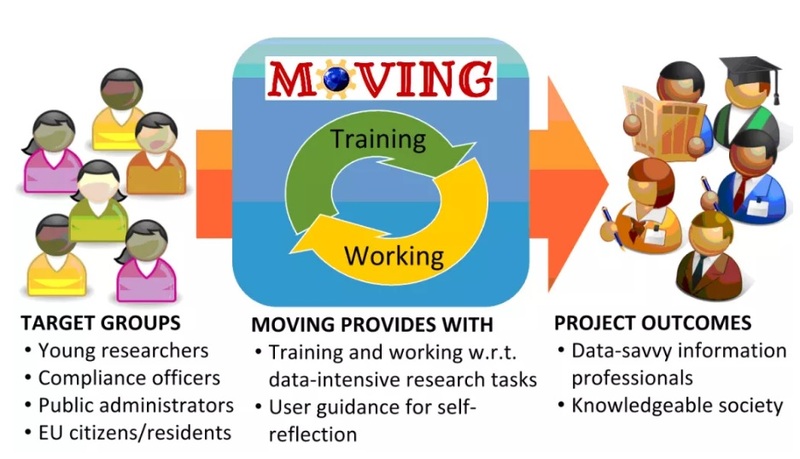 MOVING's goal is to build a TRAINING PLATFORM that will enable users from all societal sectors to fundamentally improve their information literacy by training how choose, use and evaluate data mining methods in connection with their daily research tasks and to become data-savvy information professionals. 2. A TRAINING environment (with formal and informal learning options) with information, training and exchange offers in the broad field of digital information management. It is exactly that connection of technical application and curriculum that will make the platform a holistic and thus long-term successful service. The MOVIING platform will thus provide users with technical support as well as social advice and learning functionalities in order to help them organise, filter and exploit information in a more efficient and sustainable way. (c) identifies any data that should not be made publicly available and measures to be taken for their safe-keeping. "... to generate knowledge from the data at the desired level of detail, e.g. without a need to go into too much detail. However, at any stage, the user is able to access the content if needed. Further, measures are implemented, enabling the user to access the completeness of a research. For example, by using measures of centrality of a topic, the user may assess the most important aspects of a topic..."
"The discrepancy between the theoretically offered wealth of information and the practical possibilities of their exploitation within the everyday academic work is thereby perceived as more painful and successful research today is more than ever before demanding a comprehensive respectively international perspective. Therefore, the automated analysis of large literature corpora in a specific field of research is of great interest for scientist of every discipline..."
# An event at the 2nd OER World Congress (18-20th September 2017). The 2nd World OER Congress will follow the theme “OER for Inclusive and Equitable Quality Education: From Commitment to Action”, reflecting a strong focus on the role of OER in achieving Sustainable Development Goal 4. # The 1st International Workshop on Educational and Knowledge Technologies (MultiEdTech2017) at the ACM Multimedia Conference that will take place on October 23 – 27, 2017 at Mountain View, CA, USA. The tentative date for paper submission is 19 July 2017. This one-day event will be classified as a scientific event, where scientific/educational content is presented and it’s connecting theme is “Users’ capacity to access, reuse and share OER”. The European Commission launched Open Education Europa to ensure that anyone from across the EU can find, discuss and learn how to bring innovation to the world of education.